Goede morgen en groetjes van Amsterdam! (“Good morning and greetings from Amsterdam!”) I’m so pleased to be here today and honoured to be writing for Confessions of a Montessori Mom blog/Montessori on a Budget blog! Let me introduce myself. 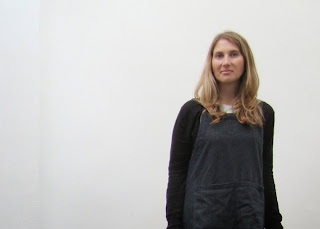 I am an Australian AMI 0-3 Montessori teacher living in the Netherlands with my two children aged 13 and 12. 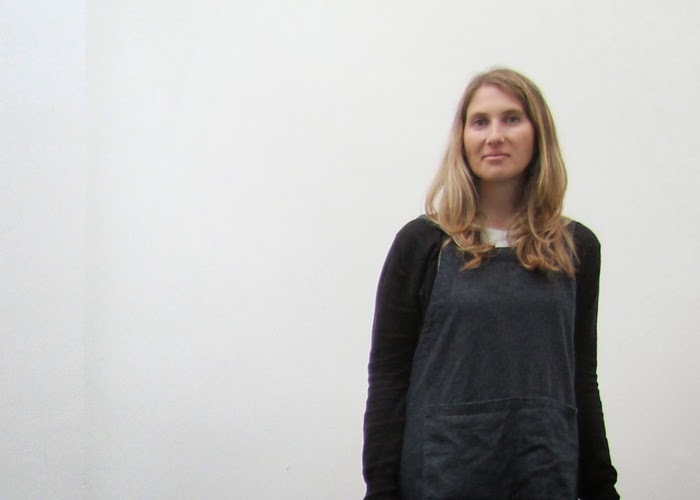 I love running a Montessori playgroup here in Amsterdam and also run regular workshops for the parents. 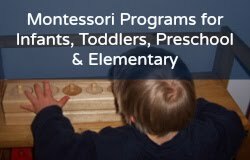 I’m passionate about helping parents learn more about Montessori and positive parenting concepts and putting them into practice. There are so many children’s books available these days. It can be difficult to know which ones are the best for your baby, infant or toddler. 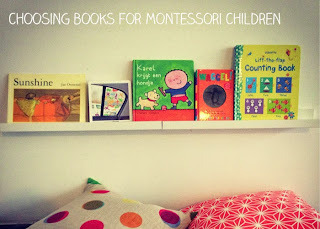 So today I’d like to share 5 tips to choosing books for Montessori children. Young children are interested in the world around them (rather than fantasy) so choose books with pictures of real objects and stories about known experiences, such as visiting grandparents, going shopping or getting ready in the morning. One of my favourite books for young children is Sunshine by Jan Ormerod -- it has no words but the most beautiful illustrations of daily life. It is also nice to have books which show children from all cultures. And, in keeping with having books based on reality, save books with animals driving cars, animals talking or animals going to the supermarket until your child is a little older. Last time I looked, there were no teddy bears driving down my street. 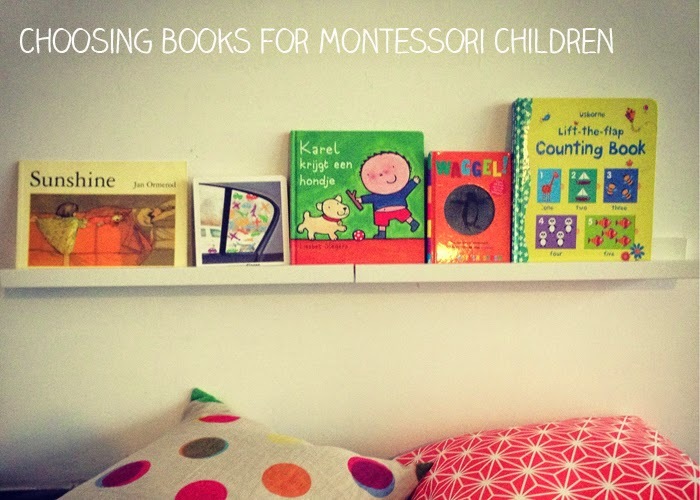 If you have been learning about Montessori for a while you would have heard of the term “absorbent mind”. Young children are like sponges and absorb everything - good and bad (!) - from their environment. So when we choose books, we should also make sure that they are beautiful so that the children can already build appreciation for beauty. When we choose beautiful things, how carefully we hold them as if they were works of art. And it won’t be lost on the child if the adult is also super excited to explore the book and admire the beauty. The age of the child will also impact the choice of book. 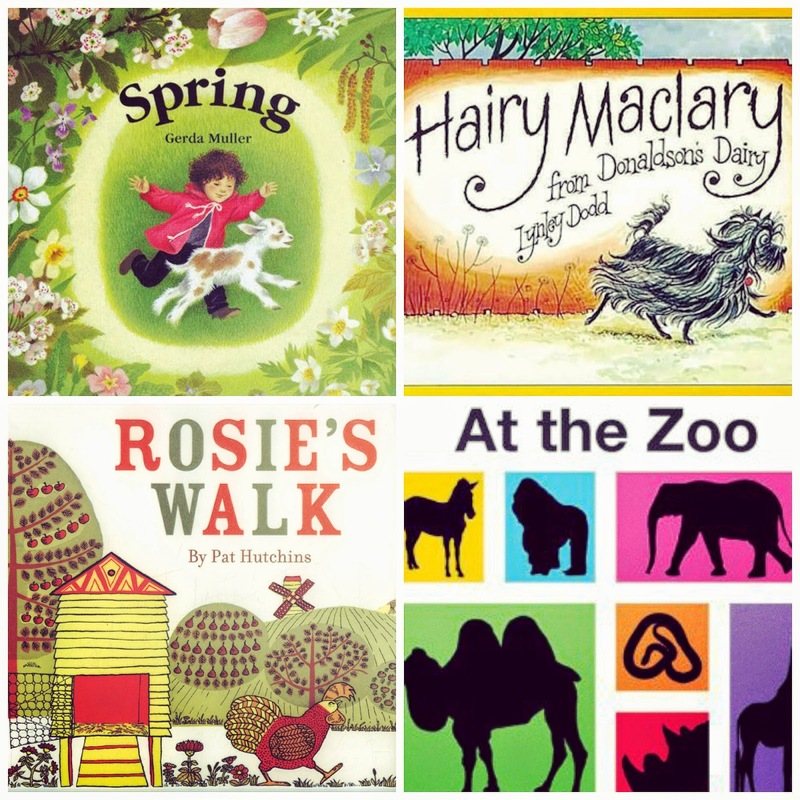 Board books are great for children under 1 who also enjoy exploring books with their mouths. Lift-the-flap books get interesting from 12 - 18 months and sturdy pages are also a good choice for toddlers. Then as the child gets older and are able to handle the books more gently, we can choose paper-back books and, for special editions, hard-back books. A book with one picture on a page is perfect for an infant; then a picture with a single word; then comes a picture with one sentence; followed by simple and then increasing complex stories. For me, there are no strict rules though. For a very young child, I might make up my own sentence to sum up a page for a wordy book. Or often we have not even followed the story instead discussing the pictures, for example, “What do you think they are doing?” or “What can you see?”. And I have read books numerous times in reverse order as the child turns the pages from back to front, sometimes quite quickly. Hilarious. Even though the child is young, my favourite books use descriptive words, accurate language and avoid baby talk. 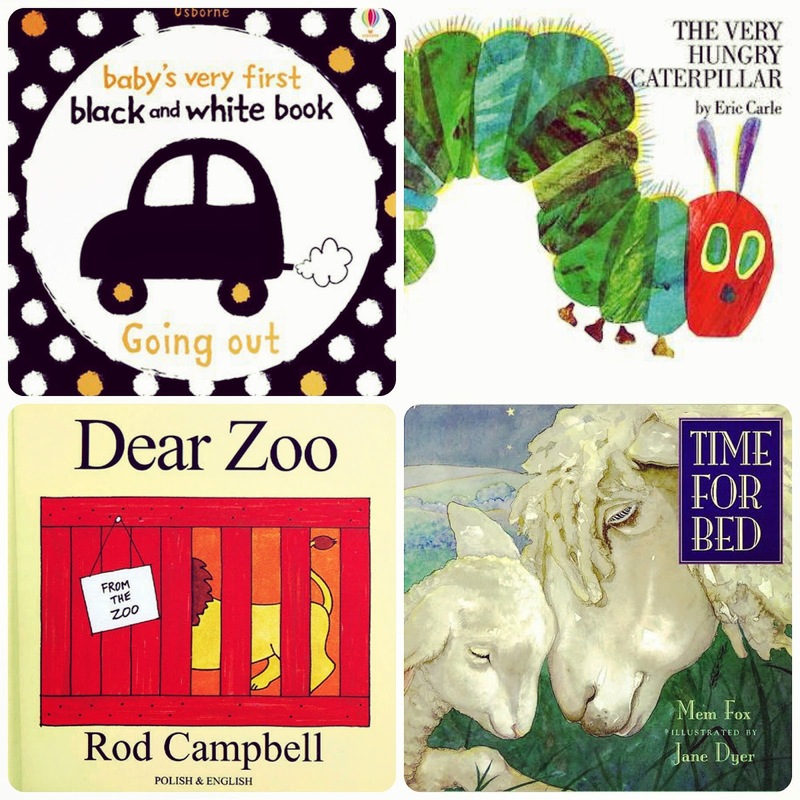 Children under 3 also enjoy books with a nice rhythm and rhyme. Hairy Maclary from Donaldson’s Dairy has great realistic pictures and a beautiful rhyme - one book that the children will ask to read again and again. I am sure I do not have to tell you that your child will want to read the same books over and over again. So it is extra fun when the books have lots of details in the illustrations and you can find new discoveries to discuss each time you read it. A great example is the book by Dutch author/illustrator Charlotte Dematons called The Yellow Balloon. 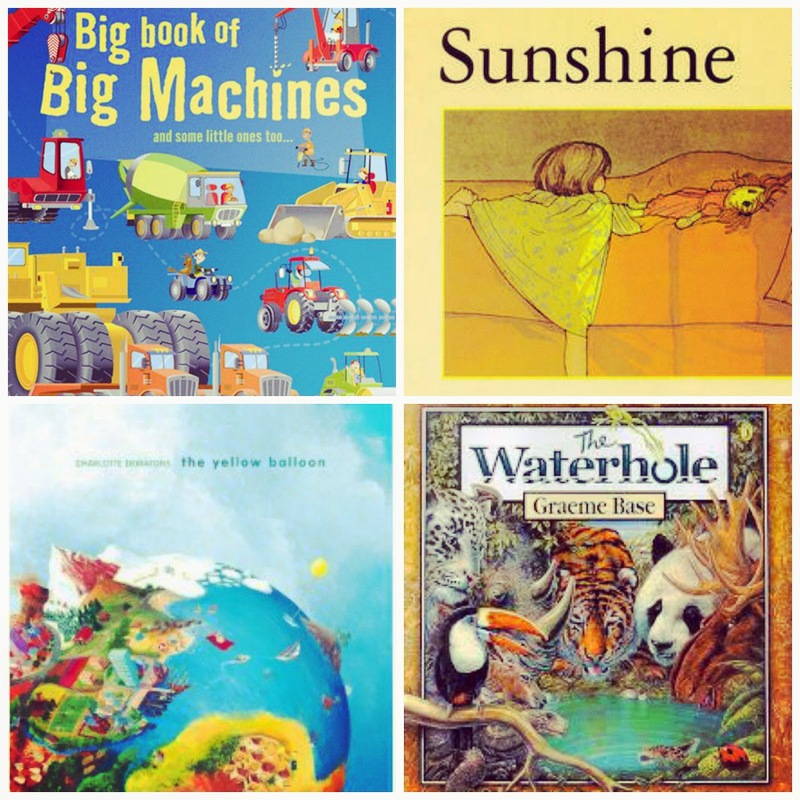 Again without any words, the pictures are so full of details that adult and child alike love to pore over this book to find new things, as well as look for the yellow balloon on each page. And before I go, here is a small selection of the books that are being read over and over again in my classes at the moment. So find a nice corner of the house, add a small chair or cushions, a small selection of books in a basket or front facing shelf, and you have a cosy reading corner that I am sure will be well used! Thanks for having me Lisa and Marie. Please come and visit me over at Jacaranda Tree Montessori (www.jacarandatreemontessori.nl/blog) and if you are ever in Amsterdam, I would love you to pop by and say hello!